Keep up at the back Gould - did it yesterday! I finally made it. I literally was stuck for 3 years at 31million plus. Plummy, I really deserve this gold star. Trying to make a comeback! Here is the exact proof Mr. Plumb. It's taken over 18 months since I reached the 26 million meter mark, but I finally got the next one done! Gold star please, Mr Plumb. Well done Tako. I'd say the season's total is worth a gold star and the 30min distance is pretty impressive as well. Great work Tako. Gold star retrieved from the bottom of the bag and duly applied. Thank you Max and David! Very nice milestone and an impressive way of celebrating it Tako, well done! Well done Philip - still a very impressive total for such a youngster! Table updated but I've off line after today for 2 weeks so any other updates will have to wait now - sorry. Me too! 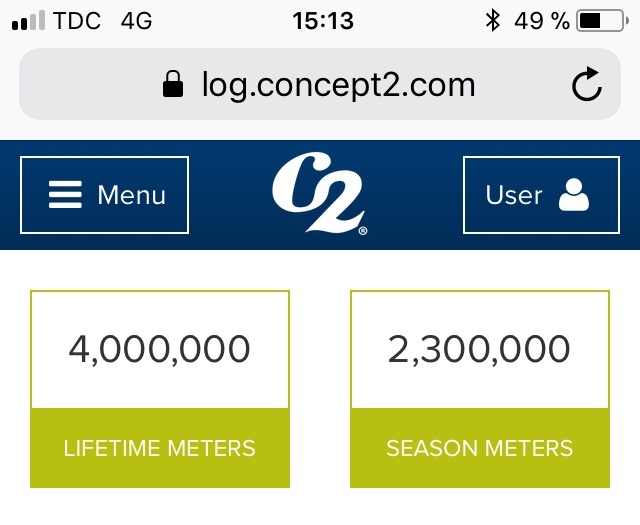 Probably the last season I'll pass two 1M meter milestones in a year for awhile. My C2/PM5 is holding up much better than I am, and it still pulls like new. What a great machine! Congratulations on your 13 million meters Fred, very impressive number! Well done on your 7million meters John, keep up the good work! Could I have one of your orange stars please. I've landed on 7 million meters with today's row. So please can I have a gold star? Great milestone! Remember to contact Concept2 for your prize! !